Bartercard is adding some Christmas cheer to hundreds of Kiwi kids affected by Congenital Heart Disease (CHD). The company is donating 400 gifts to their chosen charity Heart Kids. Some of those gifts will be sent to Starship hospital for the children who won't be at home for Christmas, and others will be given out to Heart Kids families throughout the coming year. Bartercard staff spent a morning wrapping presents before handing them over to Heart Kids NZ, CEO, Rob Lutter, who will deliver some of them on Bartercard's behalf just in time for Christmas. 'I know these gifts will put a smile on those children affected by CHD, especially at this time of year. We really appreciate the continuing support we get from Bartercard,' said Mr Lutter. Heart Kids NZ is the only not-for-profit organisation supporting Kiwi kids and their families who are affected by CHD, right through their life. Heart Kids NZ receives no government funding, has no affiliation with the Heart Foundation and must fundraise for all its services, so the Bartercard Foundation is delighted to be able to continue to support those fundraising efforts in whatever guise that may be. The Bartercard Foundation was established in April 2010 and is registered charity to support charities which require wider national prominence for their great cause. 100% of the donations raised go to the chosen charity. Unlike most other charities which aim to pass on 80% of their donations with 20% covering expenses and other costs, all of the Foundation's operating costs are paid for by Bartercard. These costs are increasing due to additional financial reporting obligations and information required to be supplied to the Charities Commission. Raymond Goubitz, Bartercard Trustee said 'Bartercard is delighted to get behind Heart Kids NZ this Christmas. It's something special to be able to donate some of these gifts to children who may not get to spend Christmas at home with their family and friends, something most of us take for granted, so anything we can do to support those affected by CHD is well worth while. On behalf of the Bartercard team, we would like to wish Heart Kids NZ and all the Heart Kids families a Merry Christmas'. About Bartercard: Since its inception in New Zealand in 1992, Bartercard has grown to over 15,000 cardholders nationwide, more than 6,000 active member businesses trading over $150 million worth of goods and services outside of the cash economy each year, 110 staff and 13 offices. Many businesses utilise Bartercard as one of their core business growth strategies to move excess stock and increase profit. Bartercard operates in New Zealand, Australia, United Kingdom, France, UAE, South Africa and Thailand. Bartercard, New Zealand’s original digital currency channel, has racked up more than $4 billion worth trading since it launched in this country in late 1992. Twenty-five years later, the company now has 15,000 cardholders nationwide and more than 6,000 active member businesses who are served by 110 staff in 13 offices. One of those members is Auckland-based Kennedy Furniture Ltd which has been an active Bartercard member since day two. Kennedy Furniture director Kevin Johnstone is as enthusiastic about Bartercard now as he was then. “To be a part of something from its inception is a unique experience. It’s been a privilege to see how Bartercard has evolved over the past 25 years and how the network has grown. Bartercard has been of great benefit to our business from the start and still is 25 years later,” he says. Bartercard New Zealand chief executive John Scott, who has been with the company almost five years after a long career in business finance and data, says the quarter century birthday is a significant achievement for a company and a concept that some people struggle to understand. “We were one of the first companies in the world to offer a digital currency where no money actually trades hands. That took a bit of explaining in 1992 and, to some degree, it still does. 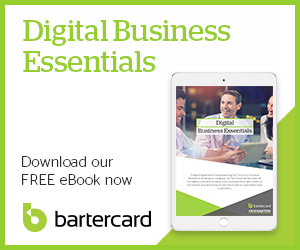 “The best way to use Bartercard is to use trade dollars to offset a proportion of cash spending and then use the funds generated to reinvest in your business. It does require a bit of lateral thinking to make the Bartercard network work for you. Our most successful members are the one who put in the effort and treat Bartercard as another business channel that can help grow their business,” says Scott. With Bartercard now operating in eight countries, and plans in place to expand further, its New Zealand business is seen as a global innovator. “We’ve successfully developed systems and solutions here that have been deployed globally, including a web-enabled search app and sales tracker databases. New Zealand is used as an incubator for new technology-driven initiatives because we’re digitally enabled, early adopters and known for our ability to back ourselves,” says Scott. Coming up next year is a mobile-enabled app which will list all New Zealand members’ products and services and link to Bartercard’s everyday rewards programme, bucqi. Scott is also working on an improved platform that will delivery real-time information based on the behaviours and buying preference of members. Strong member relationships and community activities are an important part of the Bartercard story, with the Bartercard Foundation, set up in 2010, supporting a wide range of charities. 100% of the donations raised by the Foundation go to the chosen charity, with Bartercard New Zealand paying for all the costs of operating the trust. This year, it raised T$130,000 for Heart Kids NZ. Bartercard also sponsors the New Zealand Breakers. To celebrate its milestone birthday, Bartercard head office and regional members have made a series of matching donations to worthy community groups, such as 50 bags of dog food to a pet shelter in Auckland and 50 boxes of nappies for Women’s Refuge in Auckland. About Bartercard: Following Bartercard’s creation in Australia in 1991, Bartercard New Zealand became the first international licensee a year later. Since its inception, the Bartercard Trade Exchange has grown to more than 6,000 member businesses across New Zealand trading around $150 million worth of goods and services outside the cash economy each year. The top five sectors most active in Bartercard NZ are professional services, hospitality, automotive, construction and building, and food and drink. Bartercard operates in New Zealand, Australia, United States, United Kingdom, France, India, South Africa and Thailand and plans to expand into Israel next. Last year, parent company BPS Technology Ltd also bought Entertainment Publications Australia and New Zealand, which produces the very popular Entertainment™ Book. Bartercard New Zealand is backing Central Pulse Netball for the forthcoming season, which starts on 26, March. The New Zealand team, based in Wellington, will be competing in the ANZ Netball Elite League, which is made up of 15 round robin games followed by play offs, bringing the competition to a close in June. Central Pulse Netball are no strangers to Bartercard having been a member of the network for the past five years. They have previously used their trade dollars on hospitality, catering, player accommodation when attending tournaments, as well as first aid courses. Now that the women’s netball team have the sponsorship of Bartercard, they can really start to utilise the network to their advantage and help further promote women’s sports. You can follow the championships live on SKY who will be televising all games which are to be played on Saturdays, Sundays and Mondays from late March. For all media enquiries, please contact Tina Burns, National Marketing & Communications Manager on +64 9 414 6809 or tina.burns@bartercard.co.nz. The Central Pulse franchise covers the Netball Central Zone region, stretching from Hawkes Bay across to Taranaki and down to Wellington. The zone has the largest catchment in New Zealand with over 38,000 netball players including 11,500 secondary school players and is governed by the Netball Central Zone Inc. Board. Bartercard’s world-leading innovative trade exchange system enables over 24,000 global member businesses in eight countries to benefit from the cashless economy of barter. Since its inception in New Zealand in 1992, Bartercard has grown to over 6,000 member businesses across the country trading over $200 million worth of goods and services outside the cash economy each year. Bartercard NZ gets behind SKYCITY Breakers 20 days of kindness. Onehunga High School have become the lucky recipients of a framed signed SKYCITY Breakers jersey all thanks to Bartercard New Zealand and the #20Daysofkindness campaign. Following a random act of kindness by Breakers fan Aaron Nicholls, who was seen recently paying for an elderly lady’s groceries, Bartercard New Zealand who sponsor the Breakers, wanted to pay it forward and give something back to the community as a way of acknowledging Aaron’s good deed. They were quick to jump in on the act of the Breakers launching 20 Days of Kindness, where they are calling out to the whole Breakernation to do a good deed, big or small, and post it up with the hashtag #20daysofkindness. The campaign finished on 15, February and in 20 Days has seen sponsors donate thousands of dollars worth of product and services, fans pledge multiple good deeds and the SKYCITY Breakers bring a positive effect to over 500 kiwi lives through their time and the game of basketball. There has been school visits to training for low decile schools, game day experiences for children suffering from Laukemia and a huge effort from everyone involved to get behind the idea of giving back without expectation. Bartercard New Zealand has a solid track-record of supporting over 100 communities and Not-for-Profit organisations. Onehunga High School is one of these; their partnership dating back to 2006. With their rich history and dedication to basketball, they were the ideal school to receive the jersey. Following its creation in Australia in 1991, Bartercard New Zealand became the first international licensee a year later. There are now 6,000 member businesses across New Zealand, trading over $200 million worth of goods and services outside the cash economy each year. Bartercard operates in eight countries worldwide and is the largest global trade exchange business. $80,000 for Heart Kids NZ, thanks to Bartercard Foundation. Bartercard Foundation is delighted to announce its partnership with Heart Kids NZ, the only not-for-profit organisation supporting Kiwi kids and their families who are affected by Congenital Heart Disease (CHD), right through their life. Heart Kids NZ receives no government funding, has no affiliation with the Heart Foundation and must fundraise for all of its services. The Bartercard Foundation is thrilled to be able to step in and help support those fundraising efforts. And it has wasted no time in raising funds. Already more than $80,000 trade dollars has been raised - $32,000 trade dollars of it in just one day, thanks to a fundraising event which encouraged Bartercard members to ‘Gift a gift of giving at Christmas’ to friends and family in lieu of a physical gift. It’s not just donations the Foundation is looking to assist with. It is also keen to get involved in events around the country, all of which will be advertised on the Heart Kids website throughout the year. The Bartercard Foundation is made up of three trustees who oversee its operation, on a voluntary, unpaid basis. They are Raymond Goubitz, Bartercard Trustee, Ted Midlane from Legal Consultants Ltd and the recently appointed Carmel Clark from Telephone Market Research. The Bartercard Foundation was established in April 2010 and is a registered charity to support charities which require wider national prominence for their great cause. 100% of the donations raised go to the chosen charity. Unlike most other charities which aim to pass on 80% of their donations with 20% covering expenses and other costs, all of the Foundation’s operating costs are paid for by Bartercard. These costs are increasing due to additional financial reporting obligations and information required to be supplied to the Charities Commission. The company has ambitious growth plans, and Chief Executive John Scott says the new Marketplace – launching on Tuesday, 1 November – is a major step in that direction. About Bartercard: Following Bartercard’s creation in Australia in 1991, Bartercard New Zealand became the first international licensee a year later. Since its inception, the Bartercard Trade Exchange has grown to more than 16,000 account holders across New Zealand trading over $200 million worth of goods and services outside the cash economy each year. Bartercard operates in New Zealand, Australia, United Kingdom, India, South Africa, United States, Thailand, United Arab Emirates, and Cyprus. IN A DEAL WORTH $22.5M CASH, $2.5M IN SHARES AND $5M RAISED FOR COSTS AND WORKING CAPITAL, BPS TECHNOLOGY LIMITED, WHO OWNS BARTERCARD, IS TO ACQUIRE ENTERTAINMENT PUBLICATIONS AUSTRALIA AND NEW ZEALAND. Entertainment Publications Australia and New Zealand is a popular and prominent business-to-consumer (B2C) deals platform which produces the Entertainment Book and the Entertainment Digital Membership. It has 550,000 members and a relationship with 12,000 SMEs and 18,000 NFPs. As part of the acquisition process, BPS undertook a detailed financial and legal due diligence on Entertainment. Further detail on the acquisition is set out in the presentation announced to ASX. It is anticipated the settlement of the acquisition will be completed mid-September 2016. About BPS Technology Limited (ASX: BPS): BPS Technology Limited is a leading provider of technology platforms and management systems in the Digital Payments space for Small to Medium Businesses (SMBs) in eight countries. Its technology platforms and systems help to drive customers to its SMB merchants. More than 24,000 SMBs transact in excess of 1.8m transactions worth $600m+ per annum using its various technology platforms. BPS earns fees on all transactions over the platforms via its subsidiaries Bartercard, TESS and bucqi. About Entertainment: Entertainment Publications is a business-to-consumer (B2C) deals platform with an established model proven over 21 years of profitable operations. Entertainment provides restaurant and activity guides with special offers from more than 12,000 SMEs to consumers across Australia and New Zealand. About Bartercard: Bartercard operates the world’s largest trade exchange. It allows small to medium businesses to conduct business transactions without the use of cash. There are 50,000+ card holders in 8 countries currently. Bartercard transactions can be conducted online, via its mobile app, across more than 7,000 bank EFTPOS terminals and on bucqi terminals. About bucqi: bucqi is a disruptive technology based around a loyalty platform designed for SMBs combined with a robust and innovative mobile payment app for both merchants and consumers. The payments platform has been two years in the making and has a number of patents pending. It allows consumers to easily pay for goods and services without taking out their wallet or swiping their credit card and they earn and redeem reward points via a wide range of participating suppliers. It has been launched in three regional cities in Queensland Australia and Wellington in New Zealand.